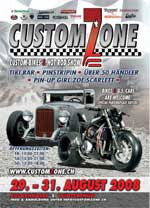 DONT MISS BETWIXT AND BETWEEN THE HOT ROD MEETINGS IN WEIL AM RHEIN OR WINTERTHUR. ITS GETTING COLDER, LOT OF RAIN, IN THE NIGHT I HAVE TO START UP THE HEATING INSTALLATION ALLREADY, I THINK, SUMMER IS OVER NOW. HOPE WE HAVE SOME NICE DAYS IN AUTUMN. OTHERWISE, IN CASE OF BAD WEATHER WE WILL HAVE MORE TIME FOR WRENCHING ON OUR CARS.....WHAT IS SORELY NEEDED. FORMERVOLKSHEROESPART 3: ALL 3 PICS SHOWS EX MEMBERS FROM E11 BACK IN THE STARTINGDAYS. KURT VOGEL STANDING CLOSE TO HIS 57 CAL-LOOKER. ROGER WEIBEL,,JJ,,SITTING IN HIS CHOPED 57. THAT WAS BACK IN THE SO-CAL DAYS AROUND 1989. MARCEL WISS WITH ONE OF THE FASTEST EUROPEEN,,FLYING HAMBURGER,, BUGS BACK IN THE MID 80s. RACE WARRIOR: KIEFT & KLOK (WHAT A NAME FOR A DUTCHMAN)...JO JO, DO KIEFEMR NO EINS & DENN HÄMMER RICHTIG EIN ANDR GLOCKE / KIEFT & KLOK. THEY BROUGHT THE RACE ROMETSCH TO THE EBI. A FANTASTIC LOOKING CAR. UP, UUPP, UUUPPP TO THE SKY: WHAT CAN I TELL? YEEEEZZZZ! THATS THE WAY IT SHOULD BE. SPEEDMAG FOTOSHOOTING: I DONT REMEMBER THE YEAR (AROUND MID 90S?) OF THE SHOOTING BUT THAT DAY WAS INCREDIBLE. ALEX COLACCI ( EX E11 ) ANDI SIGRIST ( LUFTKRAFT ) SVEN JEGGER ( HE LIVES IN CALI NOW )AND I MET GEORG OTTO & HIS FOTOGRAPHER FROM VW SPEED SOMEWHERE IN AARGAU FOR DOING A REPORT/FOTOSHOOTING ABOUT SIGIS SILVERSURFER VARIANT, COLACCIS GOLF 1 & SVENS GOLF 1. U CAN SEE THERE WERE ALSO OTHER FANS AROUND. TYPICAL SWITZERLAND. THE POLICE WAS CALLED BY A LOCAL HABITANT. HE TOLD THEM THAT THERE ARE SOME CRAZY PEOPLE ON THE STREET, DOING A RACE! WE NEEDED A LOT OF PATIENCE FOR DISPOSE THE CAVALRY. FINALLY IT WAS A GREAT DAY & THE FEATURE OF ALL 3 CARS CAME OUT SUPER SANO IN ONE OF THE VW SPEED MAGAZINES. 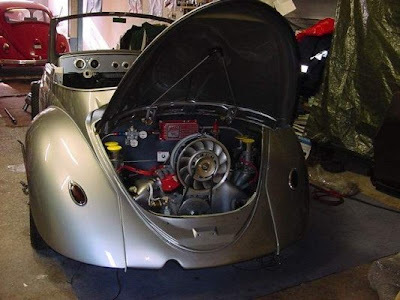 THE ONE AND ONLY: DAVE RHOADS WITH ,,DER RENWAGEN FUHRERS,, HIS BUG. 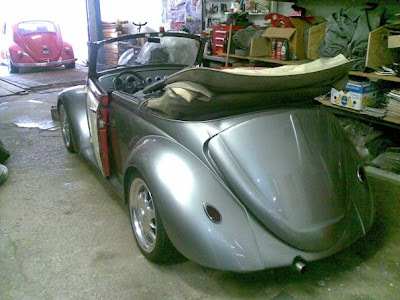 FOR ME ,,THE CAL LOOKER,, NUMBER ONE.I ALLWAYS LIKED THAT CAR MORE THEN ALL THE OTHER LOOKERS. 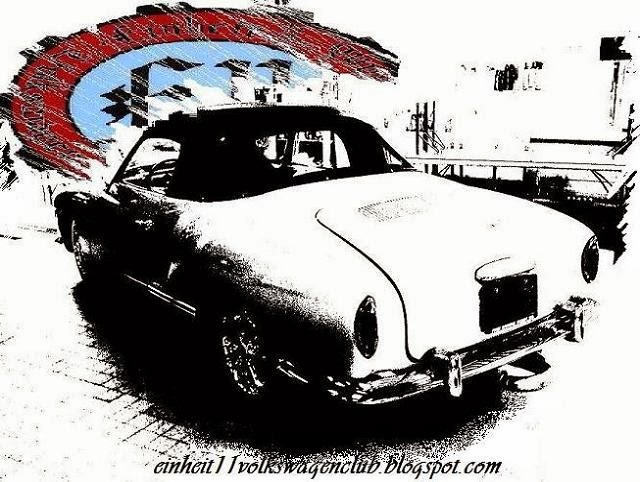 THE NEXT 3 PICS ARE FROM CARS WE HAVE HAD IMPORTED FOR SELLING THEM OVER WVC IN AESCH-BL. AND YEEEEZ. THE CARS ARE ALLREADY SOLD. WE WILL SEE WHAT COMES NEXT. COMIN SOON: THE NEW BOOK WRITTEN BY KEITH SEUME....COMES OUT IN AUTUMN. GINO & ANDY ARE STILL IN HOLIDAY WITH THEIR FAMILIES......AND I, I DO LIKE NOTHING. STILL A VERY CALM WEEK. STILL HOLIDAYTIME. STILL NO NEW GIRLFRIEND, HAHAHA, BUT THIS IS ANOTHER STORY. LUFTKRAFT RAN ITS CRUISE NIGHT WHICH WAS A FUL SUCCESS. PICS ON LUFTKRAFTBLOG ARE FANTASTIC AND WE HOPE JOINING THE CRUISE NIGHT NEXT TIME WITH SOME OF OUR CARS. TO THE BLOGS OF THIS WEEK. FROM ZERO TO HERO: MAY I INTRODUCE....ANDY ,, SIGI ,, SIGRIST. ONE OF THE SWISS CAL-LOOK FORMERS FOR OVER 20 YEARS. SEE THE PICS. YOUNG SIGI, AROUND 1990....AND THE LATEST SHOOT IN 2008. ALMOST 20 YEARS OF HUMAN METAMORPHOSIS, HAHAHAHA. BY THE WAY, THE OTHER GUY ON SOME PICS IS EX E11 MEMBER ALEX COLACI WHOS THE CURRENT OWNER OF HERBERT RAUSCHS PINK LADY. FORMER VOLKSHEROES PART 2: E11 EX MEMBERS PIERO TERUEL, MARCEL WISS AND EL PRESIDENTE TOM WÜTHRICH AT THE CUSTOM JAMBOREE IN RHEINFELDEN 1989. DER KLEINER KAMPFWAGENS & DER KLEINER PANZERS HAND IN HAND. MARK...WASH YOUR JACKET, HAHAHAHA. BLITZ & RENE RESTORE A BUG. INFACT IT WAS THE BUILD UP OF RENEs PEACH. FORMER VOLKSHEROES PART 1: YOUNG SIGI & COLACI AROUND 1990. YOUNG RENE, OHHH MEN, JIMY HENDRIX IS STILL ALIVE. CHECK THIS MEGA AFROB ON ITS HEAD. SWISSVOLKSHISTORY PART 2: THAT WAS THE CARAVAN FROM SWITZERLAND WITH DIFFERENT CLUBS ON ITS WAY TO FRANCE IN 1992. TOM, COLACI, TERUEL, HERBERT RAUSCH, BIG T, SIGI, HANSI, PETER ETC.ETC. MOSTLY OF THE GUYS STILL DO THE VOLKSWAGENING TILL TODAY. PINK LADY AT A ,,TANKSTOP,, AND CHECK THE SECOND CAR ON THE RIGHT. ITS BROWN...IT HAS NO TURBOENGINE, NO FUCHS ALLOYS AND ITS NOT THAT MUCH LOWERED. YEEZ...U ARE RIGHT...ITS BIG CHICKENS ( BIG T ) TURBO TERROR BUG BACK IN THE 90s. JÖRG BRODERS B&M ,,KOMPRESSOR,, ENGINE. THERE ARE NOT MANY BUGS WITH THIS SYSTEM AROUND. AND THAT WAS BACK IN LATE 80s. LONESOME RIDER: NO, ITS NOT GRIZZLY ADAMS FROM THE MOUNTAINS, ITS TOM DURING A TRIP TO SOMEWHERE.